Old School Ron: One squad or two, which is better? One squad or two, which is better? 1. Some rules had to be changed (Altered Core Rules). 2. I hate playing with two 5-man squads. I don't know when exactly it happened, but by the time the whole thing was over, I never wanted to play another "two squad" mission again. Maybe it's the challenge of just 5 guys against all those Genestealers. I know the Genestealer force scales up and down based on the starting Marine force so technically there's less bugs when the Marine player fields five Terminators as opposed to ten, but I'd much rather play the smaller Marine force. I'd rather play the 5-man force and loadout my guys how I think is best than play with a 10-man force. Ten Marines just seems like too much. Too many Terminators for the job. It borders on being clunky and the game feels like it slows down too much. If five can't do it, does it really need to be done then? Maybe we ought to consider just blowing the thing to pieces instead of hunting around for something we hope might be there. You know, cut our losses on this one. If you're a Marine Chapter Master, are you really going to sink 10 percent of your first company into what is almost always a guaranteed to be a suicide mission? Some Chapters just can't afford to do that. I would have to think long and hard about that one if it were my decision. And I'm willing to flame my own guys should the need arise so that should say something. I know why GW set up the missions the way they did and varied the number of models and the specific ones required for the Marine player. The new fancy models that came in the boxed set. It'd be kinda silly to make all those new models and then not provide any missions to use them in. I got it. Makes perfect sense. That still doesn't mean I have to play it that way. I'll actually keep the 5-man limit to the point of dropping a man from my squad if I want to run a Librarian or a Chaplain. The character model replacing the Sergeant in the mission so I still just have five guys. My friend plays the 5-man option too. Not sure if that's because it's all I ever play or he really likes that as well. He says he likes the 5-man approach, but I feel I may have inadvertently had a hand in deciding that for him. With over two years of playing Space Hulk regularly now, I've had the opportunity to try out a number of squad combinations in a number of different missions both official and custom ones. I still prefer playing with a single, 5-man squad. The beauty of this game is you can make it what you want it to be. You can craft your Marine force the way you want for the mission you're about to play. And if you're like me, you stick to just one squad. 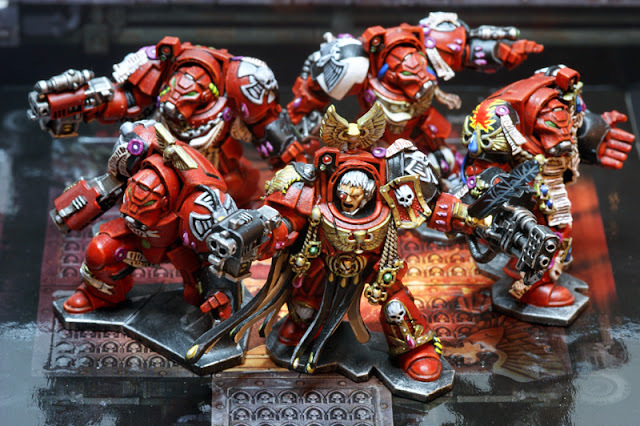 IMAGE: Space Hulk Terminators painted by Tabletop Cop.